Italian composer Fernando Sor was active in the late Classical period (late 18th to early 19th century), and his music bares many similarities to pieces for classical guitar by contemporaries like Carrulli and Carcassi. 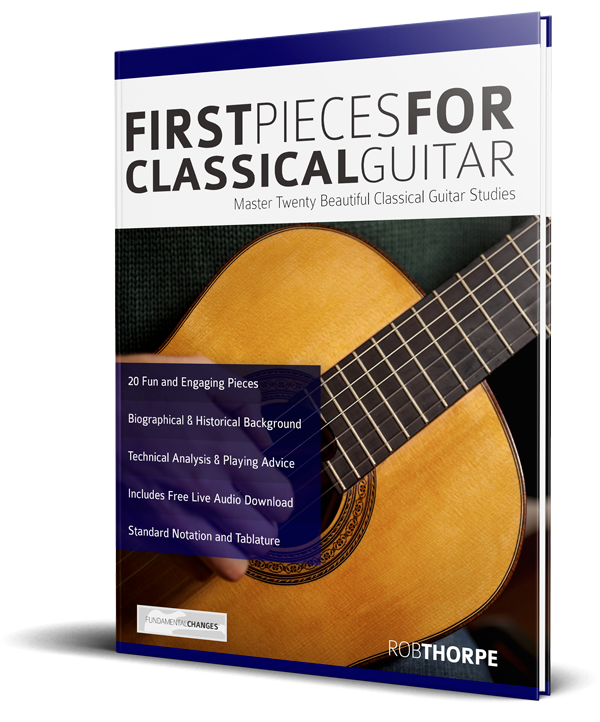 This is an extract from my new book First Pieces for Classical Guitar. The book aims to open up classical guitar music to players of all styles by providing tab and helpful pointers for 20 great pieces by famous composers. The pieces are approachable for the advancing beginner guitarist who wants to build a repertoire of fun and rewarding music. Today we will be looking at Fernando Sor’s Study #2 in A Minor. It starts with a pickup beat, or anacrusis, which anticipates the strong pulse played on the open A-string in beat 1. The convention when numbering bars is always to discount the pickup, so bar one is the first full bar. Counting into the piece with “1, 2, 3 & 1” should help you feel the correct timing. Listen to the audio to get a clearer understanding. This motif occurs many times throughout the composition as a pickup. In this piece, double-stops move around and articulate the melody. You can pluck these in either of two ways. The first option is to assign your I, M and A fingers to the G, B and E strings respectively, and use the appropriate fingers for each pair of notes. The alternative is to move across the strings with fingers I and M. Your thumb should always pluck the bass notes. The passage that first occurs in bars five to six is best plucked with P, I and M. The thumb creates a different tone to the fingers, so playing the bass notes with your thumb throughout will make the piece sound more consistent. Finally, there are some tricky embellishments towards the end of the piece. Bars twenty-one and twenty-five have grace notes (acciaccaturas). These should be squeezed in just before the main beat. In bar twenty-one the three strings should be plucked together, then a pull-off is used to sound the C note on the B-string as soon as possible. The acciaccatura shouldn’t have a rhythmic value of its own. Bar twenty- five should be handled in the same way, although here it’s a more effusive three-note turn around the target note of F. Use the first and fourth fingers to perform the hammer-ons and pull-offs. You will find it helpful to practise the top-string notes without playing the rest of the chord. If the acciaccaturas prove too tricky at first, simply omit them. It won’t detract too much from the overall effect and you can add them in once you are comfortable with the technique. As always, listen to the audio track to hear how these techniques sound. If you prefer to print the sheet music, or view it more easily on a tablet device then click here to open the piece as a PDF. Fernando Sor Study Number 2 in A Minor.